‘The stakes are high and the tensions higher.” This statement from the description of the play was certainly true of the University of Manchester Drama Society’s latest production, ‘Mallets’, written by Rex Fisher and directed by Merle Wheldon-Posner and Felix Firth. Set in summer in a garden in South Gloucestershire, the fast-paced and entertaining comedy seemed to stir the pot somewhat in its forty-five minute performance. Set in an English country garden, ‘Mallets’ follows upper-middle class couple Philipa and Sam, who bicker over grass, friends and croquet. When they are joined by old friend Kate, the discourse grows and things get heated, as the summer afternoon takes a darker turn. The play was set in a relatively apt and interesting location, Withington Bowling Club, as well as the quirky and fun addition of being encouraged to buy a glass of Pimms at the makeshift bar, despite it being the end of November. Though it did feel a bit wrong drinking a Pimms whilst wearing a coat and scarf, it worked in supporting the setting and the fun and slightly wacky feel of the play. Unfortunately, though, I think the space could have been better utilised. 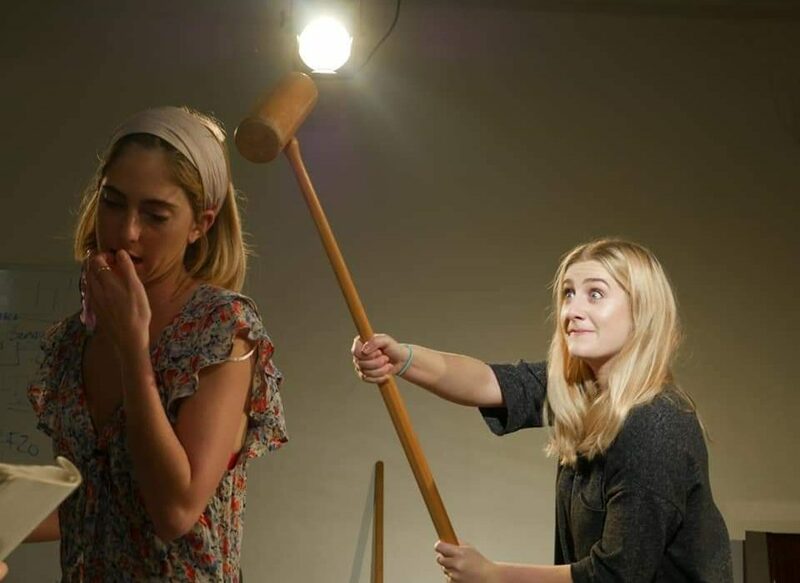 The actors had a very small amount of space to work with, a scene when Kate helps Philipa with her croquet technique looked particularly awkward as they had hardly any room to swing the mallet without being at risk of whacking an audience member on the front row. The acting was good and each had a different style that blended well together and worked in the performance. Eliza Teale was commendable as the soft-spoken, quick-witted and fed up Philipa. Lola Byam Shaw did well in playing the kooky, bright-eyed and ditsy character of Kate (think Alice from Vicar of Dibley) and Harry Frederickson stood out as the irate and grass-obsessed (the lawn kind) character of Sam. His performance certainly drew a lot of laughs from the audience. The play, which begins as a very light-hearted affair, turns more sinister and violent when Sam hits Philipa and sends her crashing to the floor. I think the play perhaps would’ve been more effective if it had have stayed away from some of the more sensitive subjects or at least dealt with them slightly differently. Though great comedy is often provocative and makes light of some of societies darkest and most sensitive aspects, it felt as though the play perhaps missed the mark in some places, particularly with the themes of sexuality and domestic violence, which seemed brushed over and trivialised at times. For the most part though, when the play centred on marital bickering, stories from couples holidays and the farcical posh-ness of the characters, the play was entertaining and funny and it certainly succeeded in generating a few laughs and perhaps a few winces as well.